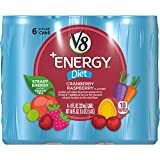 V8 Energy Drink is V8's attempt at a healthy, juice-based energy drink. The have a few different variations, but all flavors have the same amount of caffeine per can. 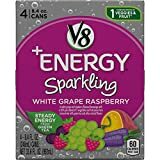 This energy drink provides a full serving of fruit and vegetables while having just 50 calories. There are no added sugars, but it's additionally sweetened with sucralose. 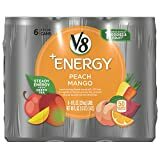 The caffeine in V8 Energy comes from green tea extract which provides a natural lift as well as the amino acid L-theanine which is believed to provide added focus. 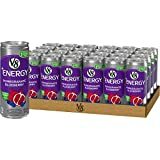 V8 Energy and V-Fusion Energy aren't suitable for children or those sensitive to caffeine. Water, Reconstituted Vegetable Juice Blend (Water And Concentrated Juices Of Sweet Potatoes, Purple Carrots, Carrots), Reconstituted Fruit Juice (Water And Concentrated Juices Of Apples, Pomegranates, Blueberries), Contains Less Than 2% Of: Natural Flavoring, Malic Acid, Green Tea Extract (With Natural Caffeine From Green Tea), Citric Acid, Vitamin C (Ascorbic Acid), Sucralose, Niacinamide [Vitamin B3], Pyridoxine Hydrochloride (Vitamin B6), Thiamine Mononitrate (Vitamin B1), Riboflavin (Vitamin B2), Cyanocobalamin (Vitamin B12). Sugar content: 10 grams (per 8 ounces). 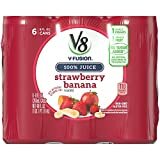 V8 Fusion Energy Drink contains 10.00 mgs of caffeine per fluid ounce (33.81mg/100 ml).